Back to school is breathing down our necks. Can you believe it? Where I’m from, some schools start in the middle of July! As a teacher, I don’t start until the beginning of August, but school mode has already started for me as I prep my classroom for the new year. While you might still have a few more weeks (or months- lucky ducks!) until school starts, I wanted to share a few study tips I have for us geekgirls! And since a lot of us are taking summer classes, participating in Camp NaNoWriMo, or working, these tips can be super helpful for that as well! Ambient Noises: One of my absolute FAVORITE things to do while working or studying is watching these ambient rooms from ASMR rooms on YouTube! If you’ve ever wanted the chance to study in the Hogwarts Library, now is your chance! I mean, just look at how gorgeous this is??? The best part is that these are about an hour long each, so put it on loop and snuggle up with a cup of butterbeer and your textbook! She’s also got other scenes from Harry Potter as well as Game of Thrones and Lord of the Rings. Snacks: Who doesn’t love snacks while studying right? But don’t settle for just any old snacks! Nerdy snacks are a must! One of my favorite people to follow for nerdy snacks is Jenn Fujikawa from JustJenn recipes. She makes the most adorable nerdy foods! 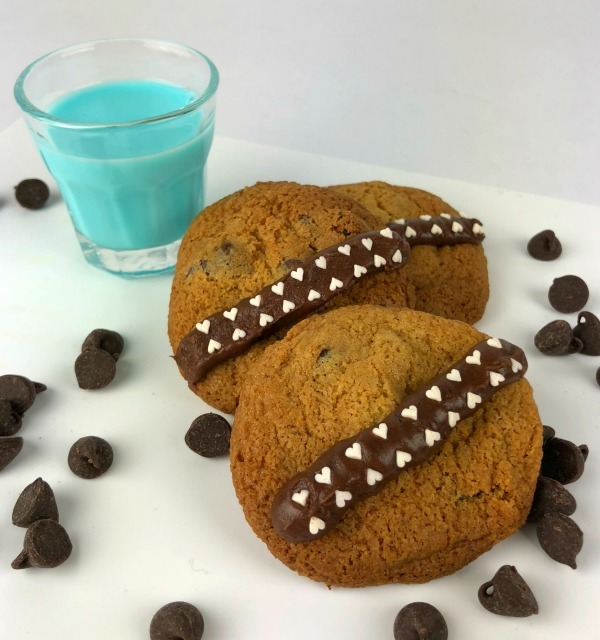 Can we just talk about how stinking cute these wookiee cookies are??? And the blue milk!!! Luke Skywalker would be so proud. Music: In case the ambient sounds of the Gryffindor Common Room won’t cut it for you, there are some great music options for studying! Definitely try to avoid music with words. The lyrics can be distracting, and your study session might turn into a dance off (we’re looking at you, Star-Lord). So to avoid that, try soundtracks! I loooove studying and working to any of the Star Wars soundtracks (Rogue One is one of my faves). Lord of the Rings is another awesome choice. And if you’ve put off studying until the last minute, any of the Marvel soundtracks (I especially enjoy the first Avengers) will have you feeling like a superhero in no time! Most of these music options can be found on streaming sites like Spotify or Amazon Music. Comfy Clothes: While studying in cosplay might be the coolest thing ever, it’s probably not the most practical. Instead, pull on an oversized t-shirt (Target has some GREAT options in the men’s section) with your favorite superhero or fandom print. These shirts aren’t too expensive (about $13), so you can grab a few and always stay comfy! If your dorm room feels more like Hoth (I had one that was like that! ), nerdy sweatshirts are always great options! Check out sites like Etsy and Jane.com for adorable sweaters that won’t break the bank. There we have it- a few short and sweet study tips that are perfect for the geekgirl! Do you have any others you would add to this list? I’d love to hear about it in the comments!